In any customer interaction, the words you say either ruin your relationship with a customer or build it up. That is why it is important for any company to do this right across all customer service channels. So, how to say “No” without spoiling your customer service experience? Here are 8 tips to begin with. Assert your refusal. If you refuse to do or to deliver something your customers request, it does not mean you do not want to do this. This is just something your company does not provide. Explain this carefully to your customers without giving an empty promise. E.g. “Unfortunately we are not planning to implement this feature in the foreseeable future, sorry for disappointing news”. Say “Yes” instead of saying “No”. When you can say “Yes” to something more important for your customer, do this. E.g. “Where can I download my chat conversations?” – “For security reasons we do not store chat transcripts on our servers, we send them directly to the email defined for this purpose in your account. Protecting our customers’ data is our main priority”. Deliver positive news, even if you had to say “No”. No matter whether you provide any kind of service or run an online store, there is always something you can offer your customers to maintain your relationship. Even if you had to refuse, try to find something your customers will be interested in. Just do your best to offer a positive outcome. E.g. “I would be glad to offer you some extra customization and recommendations for optimizing your live chat customer service”. No matter how busy you are, do not leave unsaid words and explain your customers everything carefully, especially if you delivered negative news. It is important that people are aware that you are actually listening to their concerns. 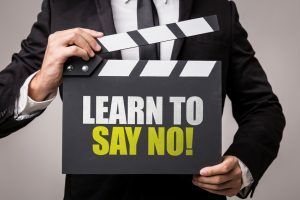 If you just tell them “No” without explaining, they will feel upset and frustrated. However, if you provide detailed explanation, you will clear up their concerns. Do not be afraid to say many words. It will not take much time, but will definitely add more positivity to your conversation. Before you say “No” to customers, think of alternatives. Is there anything you can do for them? In most cases you can offer something and smooth over the effect of your negative news: “Though we do not support this payment method, we can keep your account active while you are sorting out the issue with your bank”. Focus on customer experience. Listening is one of the most important ingredients of superior customer service experience. Listen carefully even if you know that you cannot offer the best solution right here and right now. After you collect all information, you may offer an alternative and provide recommendations that will show your desire to help. Listening helps your company to improve. And this is true. If you not only listen to what your customers say, but also carefully document this, you can use this information to improve your products or service in future. Our customers are the best source for details about our success and failures. We can use the data they provide to make our company better. “I am not authorized to apply this update now. Please hold on for a while and I will check if there is a technician who can do this right away”. If you say “No” to customers, follow them up with good news and with your “Yes” to the feature or product they inquired. Keeping your customers informed about your progress is important if you want to win their loyalty. A simple follow up will not take much time. However, if you forget to notify your customers about available solution and they will find it out themselves, this will definitely spoil your reputation. It often happens that we have to say “No” to customers. However, we should be aware that they are waiting for positive news and will switch to competition if they do not get any. You are welcome to share with our readers your ideas about giving negative news. This entry was posted in Articles, Best Practice, Tips and Tricks and tagged customer experience, customer service, deliver negative news, say no to customers. Bookmark the permalink. I think that the key thing for me is to explain why. If you have a good reason then most customers will accept that. And if you can’t offer a good reason then maybe you ought to change your policy…. Ola, excellent topic to address, many times I had to say no to my clients, only some who understand and end up getting more faithful, others do not even want to know and end up calling their service garbage. Thank you for your comment, Natallia. Giving negative news is a real challenge we face while communicating with customers. Saying no to a customer should be part of every company’s routine. Often the customer is demanding much more than we can offer and this gets bad for both sides. it is fundamental a good treatment for the clients with the objective of loyalty and make the company grow. These were excellent tips, thank you. I’m from Brazil and I discovered your blog in a google search. I’m really enjoying the content. Good job! I think this is the best sentence of the text: “Deliver positive news, even if you had to say ‘No'”. Focus on customer experience, that for me is the best advice ever, just listen to your client. I really need to learn say no for some customers. Thank you for the tips.